Ever since I heard Ella was opening a Deli I knew I had to visit and finally during a recent weekend getaway I did! The Deliciously Ella Weighhouse Deli sure didn't disappoint and bet all my expectations. The food was absouelty incredible and really showcased the ingredients as their own. The deli itself is small (there is seating down stairs), but very welcoming with soft timber and blues tiles. For more details on what I ate, checkout my London in 48 Hours blog post. 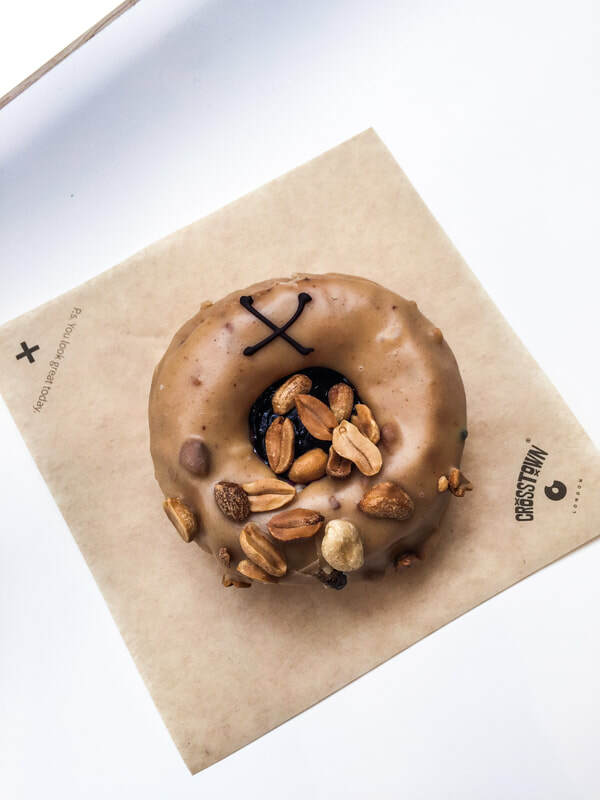 Crosstown Doughnuts is the King for suppling doughnuts across London with locations all of the city. They offer very enticing flavour options and some vegan varieties too. 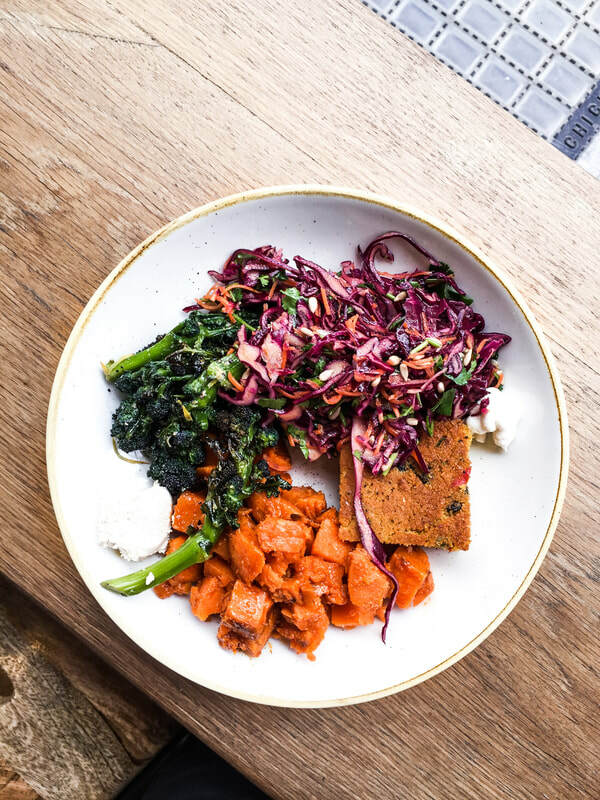 However, up until recently they opened an entirely vegan store just off Oxford Street (and only a stone throw away from Deliciously Ella's Weighhouse Deli). After standing by their display window for sometime I gave in to my natural instincts and went for the Peanut Butter Berry. (Anything peanut butter flavoured I'm there!) My doughnut was everything a doughnut should be; light without being doughy, not too oily and more importantly delicious. Crosstown Doughnuts really are amazing and I highly recommend if your looking for a sweet treat. Restaurant chain Wagamama is somewhat and icon for high quality Asian fast food. On every occasion I've visited London I alway eat at Wagamama as it's conveniently located near Wholefoods, Kensington High Street. Most recent visit had somewhat more interest, as they now have a vegan menu. They had vegan options before, but have expanded and is now found on one page. This time I chose their new vegan Ramen, which was very tasty but, a little oily for my liking and tends to be the case with Asian cuisine. Would I recommend Wagamama? It is very good, but I think my taste buds have changed and I would rather Deliciously Ella any day. Mildred's is another gem with 4 locations across London. Their reputation is very highly regarded among the veggie community and one of the number 1 veggie friendly eateries to visit when in London. 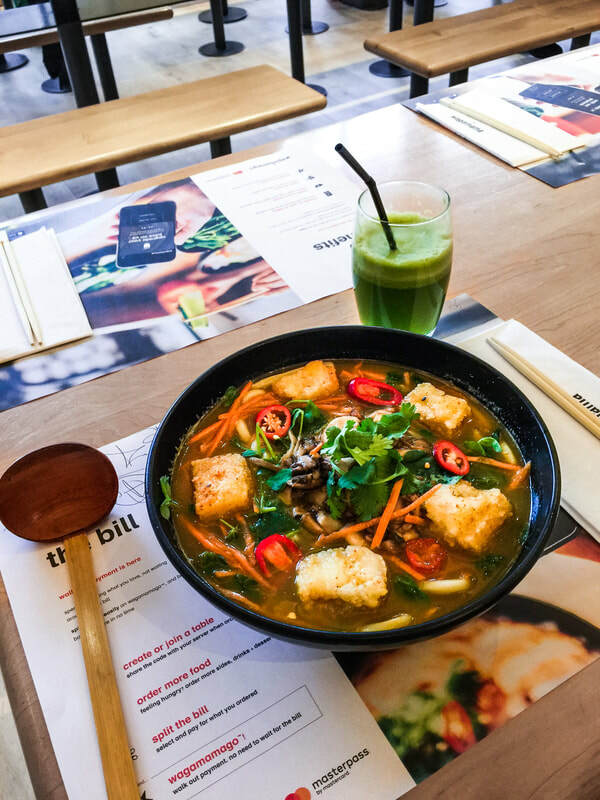 ​On the particular day I ate at their Soho location, it was buzzing and casted an incredible vibe. 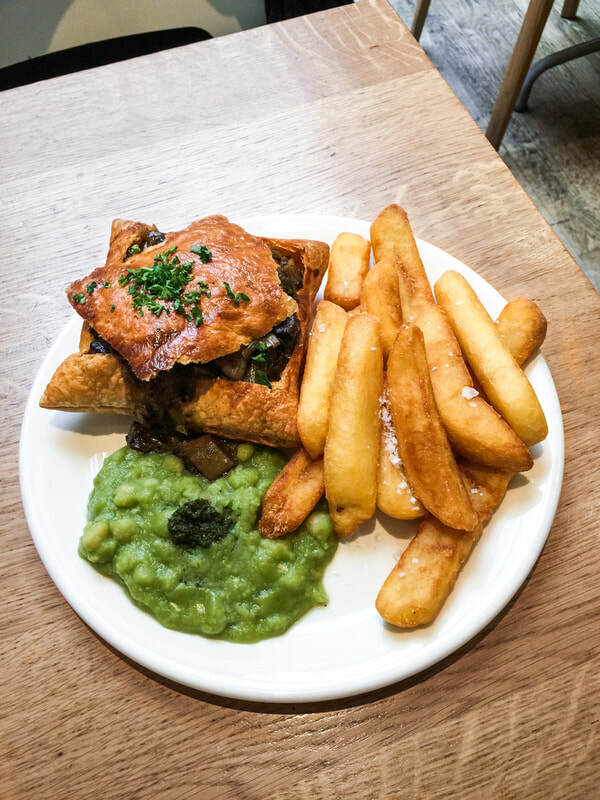 The old English style pub is unlike your normal and serving vegan/ vegetarian traditional pub meals as well as fusion. After hearing many conversations about Wulf ​& Lamb on Instagram & YouTube, I made it top priority to be my next London foodie destination of choice. Situated just off the 'posh' Sloane Square in the heart of Chelsea, the potentially pretentious restaurant sure didn't seemed 'too posh' when I dined. They did however have a high quality fit out with marble tables and plush large comfortable seats, but the vibe was relaxed and welcoming. 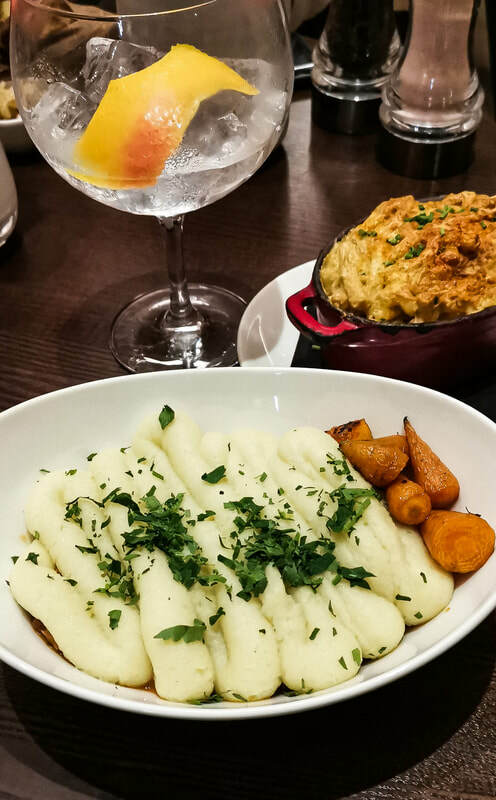 Wulf and Lamb is 100% vegan with many classic dishes- burgers, pie, chilli con carne. A lot, if not all menu items could easily be achieved at home by the capable cook, which may deter people from dining here due to the price tag associated with the dishes. Regardless of this, I was eager to enjoy myself as I was dining with friends. I ordered the Wulf Pie, pulled jackfruit and lentil stew with mashed-potato and baby carrots as well as the famous Mac ’N’ Cheese. Both dishes pleasantly surprised me with bold rich flavours. The Pie's chunky jackfruit really added a 'meaty' texture and didn't resemble fruitiness. The Mac 'N' Cheese in my opinion stole the show, with a molten cheesiness that tasted more like the real thing rather than a 'copycat' made with cashews and nutritional yeast. My drink of choice for the evening also deserves a high mention, a non-alcoholic spirit by Seedlip. Previously I'd heard of this company for not only their innovative drink, but their stylish branding is totally on point. I went for the citrusy Grove 42, which was rather delightful and a must try. Wild Food Cafe has been one of those bucket list eateries I've been dying to try. It's probably been on my list a good 4 years, but I haven't made it a true priority as they specialise in 'RAW' food, (I've now learned they offer cooked food too) which is often considered 'extreme vegan' for my fellow company. It was 14:30 and I was on my way to BLOCH dancerwear and needed to find some lunch, post a strenuous ballet class. 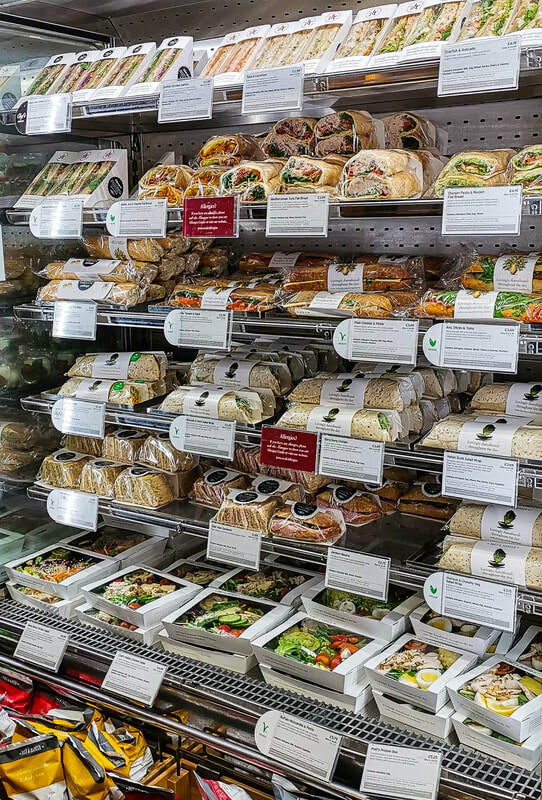 Normally I would opt for the trusty Pret A Manger, but I was craving some freshness, rather than dense bread. After contemplating and winding my through the puzzle like streets of Convent Garden, I stumbled across Wild Food Cafe, BINGO! The interior of Wild Food Cafe was smaller than I expected with communal tables, seating quite a crowd. I was luckly to find a seat by the window, looking over the bustling Neal's Yard (one of my favourite scenes of London). 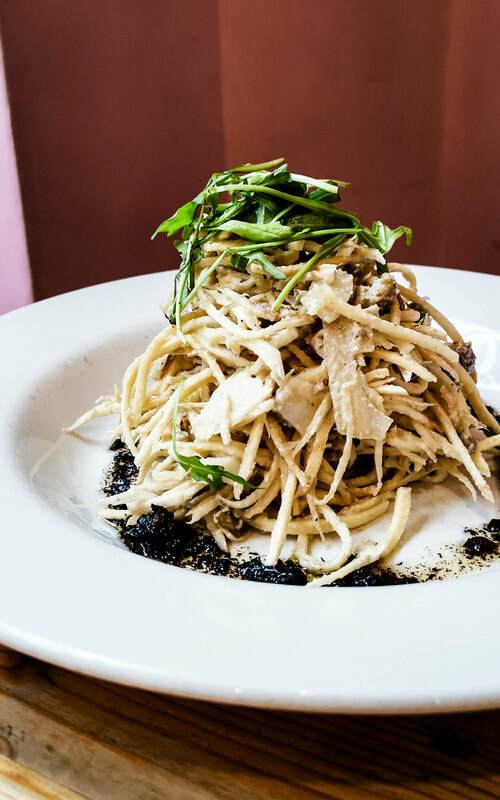 For lunch, I enjoyed Spiral Way to Heaven- raw celeriac & parsnip noodles, in a creamy pine nut sauce with truffle oil, pink olives and rocket. This dish was clever, very satiating and overall delicious! I particularly liked the pink olives dotted throughout, which added a 'bacon' like effect, and the generous amount of truffle oil was my idea of heaven. My only criticism was the dish was very salty, assuming it was because of the over seasoning in the creamy sauce and the combination of the olives was a little too much. Wild Food Cafe made a lasting impression and the people behind the cafe really know how to make vegetables shine. For my next visit (yep, I loved it that much!) I'd like to try one of their speciality hot or cold drinks; spiked with medical mushrooms, adaptogens and lustful ingredients cacao butter and cacao paste. ​I also here they have a new stunning sister restaurant in Islington that I'd also like to adventure to. ​​Let's begin by saying, I love Pret. Regardless of them knowing the market and what people want, the food is aways delicious and made fresh daily. Pret also serves great coffee, and that's coming from someone who's a "self proclaimed coffee snob". ​I particularly like a small latte, 1/2 filled (I find their cups to be massive compared to Aus) with their rice and coconut milk. Yum! by CHLOE. is a fast food restaurant, but "healthy" with the company's ethos serving "nourishing meals made from whole ingredients that can have a positive impact on their overall mind, body and health." 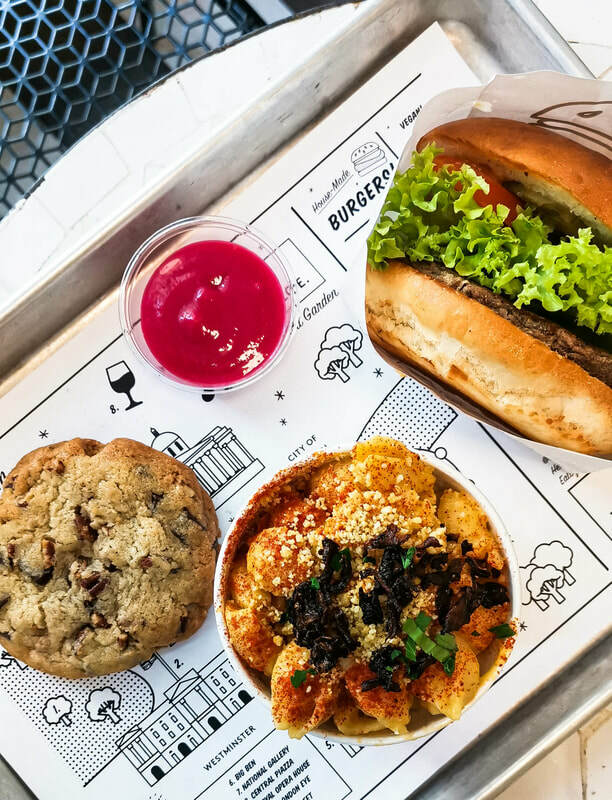 ​With classic dishes found on typical fast food menu's, burgers, fries & milk shakes, they also serve caesar salad, mac n' cheese, and a BLT sandwich, 100% plant-based of course. I played it pretty safe with my meal, as I wanted to get the full representation of the company and what they're most famous for (I may of had an excessive Instagram stork before eating here...). Mac n' Cheese, sweet potato-cashew cheese sauce, shiitake bacon and a choc-chip cookie. The burger was a little underwhelming and tasted rather bland, I ended up adding chipotle mayo and more beetroot ketchup to give it flavour. The Mac n' Cheese however regained the meal, with the comforts of pasta covered in a cheesy creamy sauce. The shiitake (mushroom) bacon definitely made a statement and I'd be happy to pay the extra pound to add more. I finished the meal off with a choc-chip cookie, that tasted like your mum's homemade cookie, ladened with butter and sugar. I can never say no to a cookie.